The Meon is a rare and precious habitat – it is a chalk stream, fed almost entirely by springs rather than by rain, and it supports a unique ecology. Less famous and smaller than the Rivers Test and Itchen, it is a more ‘natural’ river, with fewer modification made by man, and has more energy due to its steeper gradient. The river rises near East Meon, Hampshire and flow south-westwards for 34km through the Meon valley before emptying into the Solent estuary at Titchfield Haven. For over half its length the river flows over the permeable chalk of the South Downs, with a visible change of character at Holy Well near Wickham where the underlying geology changes to impermeable Reading Beds and London Clays. The river drains a small, rural catchment that is dominated by mixed farming, with a southward increase in ‘horsiculture’ and urban area. The waters of the river and the chalk aquifer have been important to people for thousands of years and are an integral part of the culture of the valley and contemporary life. In 1086, there were already 33 mills on the river and remains of water meadow systems dating back to the 1600s can still be seen today. The Izaak Walton pub in East Meon is testament to the trout fishing interest on this river that is still evident, but not to the extent of the Rivers Test or Itchen nearby. As well as cultural heritage the river and its valley are rich in biological heritage. Species found on the river include otter, bullhead, brook lamprey, water crowfoot and kingfisher as well as more recent additions such as egrets. Chalk streams are identified as priority habitats under the European Habitat Directive and the UK Biodiversity Action Plan. The whole river is designated as a county Site of Importance for Nature Conservation (SINC) and the upper third is protected by the South Downs National Park. The Nature Reserve at Titchfield Haven is a Site of Special Scientific Interest and is an important area for birds, including bittern, sandwich tern, brent geese and a stopping off point for migrating osprey. You can read more about the ecology of the Meon in ‘Rivers’ by Nigel Holmes and Paul Raven.Purchase a copy here. 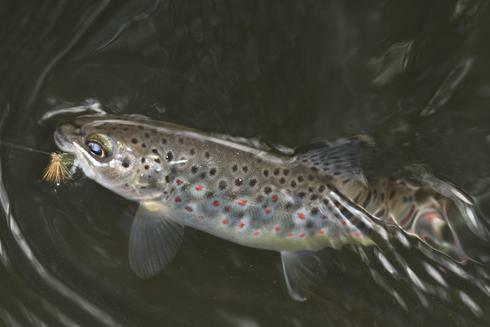 The River Meon support a good population of fish, and is a particularly well known for its wild trout. Sea trout and occasionally one or two salmon come into the river from the sea to spawn. In addition to trout, there are good numbers chub, as well as eels, bullhead, minnows and brook lamprey. A few grayling can be found, generally below Wickham, and below Titchfield there are dace, roach and flounders. Upstream Dry Fly have a beat at Midlington between Soberton and Droxford. Fly fishing is a large source of recreation along the River Meon, but it's chalk stream also is a valuable wildlife habitat. There are are varierty of different wildlife species that populate the length of the Meon, which can be great to go and see if you can spot them, from kingfishers to otters. There is also a trail that runs the length of the Meon, and Titchfield Haven National nature reserve is situated in the lower Meon, which can be visted to go for walks, with the bonus of beautiful scenery and the chance to spot some wonderful wildlife, as well as interesting plant species. From Old Winchester Hill (with its iconic hill fort) and Butser Hill on the South Downs, to Titchfield Haven on the Solent, the river Meon has attracted settlers through the Bronze, Iron, Roman, and Saxon eras to modern times, including D-Day and Churchill. Recent evidence shows that the Meon Valley has been inhabited for at least 5,500 – 6,000 years! The name itself comes from Meon, is a Celtic (ancient British) word meaning ‘Swift One’, the name also of one of our local ales! The Meonwara (Meon People) came from what is now Denmark and settled in the Meon Valley after the Romans left Britain in 410 AD. For seven centuries or more (until, and after, the Norman Conquest in 1066) they developed the Meon as a fertile farming valley running from the South Downs at East Meon to the Solent at Titchfield Haven. Izaak Walton author of the ‘Compleat Angler’ fished the river Meon and a pub in East Meon carries his name, whilst the founder of Lords cricket ground buried at West Meon church lends his name to a pub there too! Rising at the foot of Butser Hill, the River Meon flows for around 35km through rural East Hampshire before flowing out to the sea at Hillhead Harbour. The upper part of the catchment is underlain by the chalk but the variable nature of that chalk has a fundamental impact on flows in the River Meon. More clay-like older chalk at East Meon and at Warnford causes springs which increase flow in the river. Boreholes at the cressbeds in Warnford also enhance flows in the river at this point. However where the more permeable younger chalk is located, groundwater levels fall below the bed of the river in the summer months which causes flow in the river to seep back into the chalk. This happens to such an extent between Warnford and West Meon that the river dries up. Downstream of Meonstoke, flows gradually reduce as the river flows over the permeable chalk through Droxford and Soberton. South of Soberton, the river then flows onto the clays, silts and sands of the Hampshire Basin. These deposits provide a lot of run-off after rainfall events but do not support river flows during dry periods. The small catchment and more clayey older chalk give the river a higher range of flows than the adjacent chalk River Itchen. The range between high and low flows is 20 times for the Meon and only around five times for Itchen. The majority of abstraction in the area is for Public Water Supply with a few abstractions for agriculture and spray irrigation. Many of these spray irrigation licences take water from the river and old canal downstream of Titchfield. There are also large abstractions for watercress growing at Warnford, although the water is returned to the river close by. Portsmouth Water and South East Water abstract groundwater from the Chalk for public water supply from four locations close to the river. Two of these are small sources at East Meon and West Meon and there are two larger abstractions close to Soberton. Abstraction for public water supply has generally been falling over the last 40 years. This fall in abstraction is as a result of reductions in demand for non household use, reduced leakage from water company mains and more efficient use of water by customers. Portsmouth Water voluntarily agreed to reduce their abstraction licence at Soberton in 2003. A model of the groundwater system is used to look in more detail at how these large abstractions can affect flow in the River Meon. The model suggests that the river above Droxford is largely unaffected by abstraction but flows can be reduced by 10 – 25% as the River Meon flows past the large abstractions at Soberton. Despite this abstraction impact, under typical flow conditions and existing abstraction patterns, recent data appears to show that the river sustains a healthy ecology. However, continued monitoring is needed to confirm this and concerns still exist about the impact of abstraction during low flow conditions.